I’ve written a list of all the little things that bring me moments of joy throughout the day. Each moment puts a smile on my face and a spring in my step, and I am here for that. Lils, the rabbit, hopping over to me and running in circles around my feet, to greet me every morning. A bestie texting me, checking in to see how I’m doing. Being able to wander round St. James’s Park at lunch with a work mate, watching the three resident pelicans in their synchronised waddle. Calling my mum on my walk home to talk through the day. Pulling on my glittery Gucci sunnies which always make me smile. My husband making me a delicious dinner each and every night – well, with the exception of Tuesdays and Thursdays. Watching the bees and butterflies swarm around our out-of-control lavender bush. My former work bestie sending me her daily cute baby snaps. Wearing florals in the sunshine. Admiring the colourful flowers beginning to bloom in our garden and appreciating how much work we’ve put in to get it looking respectable. The heady smell of sun cream and barbecues. 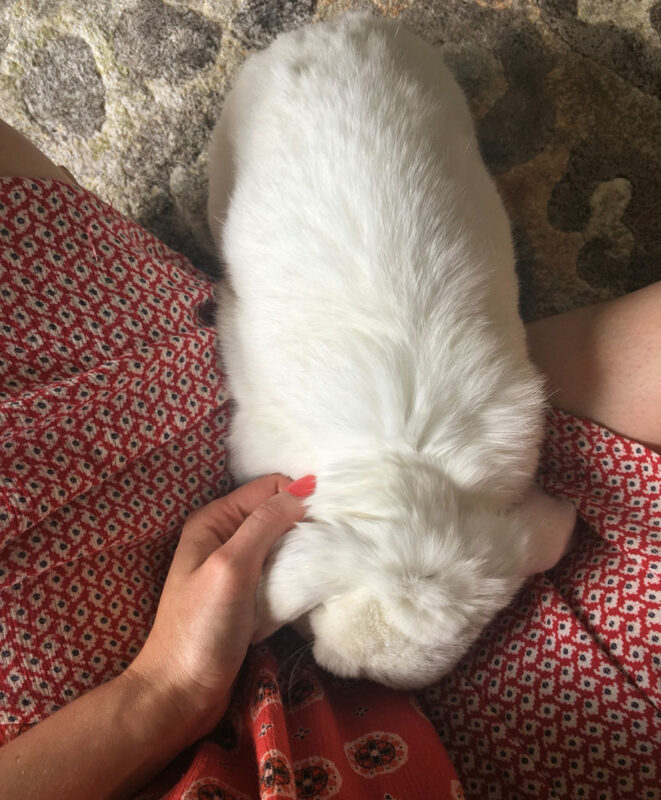 Sitting on the living room floor in the evening, giving it a tap and having Lilly bound over, before resting her front paws on my legs and snuggling in for affectionate cheek rubs. Getting in bed and journaling my one high and one low from that day with my husband. Spritzing my pillow with Deep Sleep and being rewarded with the comforting smell of lavender and camomile. Pulling on my eye mask and finishing the day with a spot of meditation. Knowing that I’m finally feeling more like my old self. But a bit more improved.